Salem, Oregon-based chiropractor, Dr. Daniel O. Cook, DC, is reputed for his highly-effective, specialized treatments for automobile injuries. Auto accidents are one of the leading causes of bodily injury in the United States and one of the most common reasons drivers seek chiropractic care. Car crashes, whether low-impact or high-impact, can cause serious damage to the body’s tissues and joints. Though these injuries can be difficult to detect at first, if left untreated, they can lead to chronic pain and potentially increased degenerative change in the joints of the body. A chiropractor can treat neck injuries, whiplash, back injuries, soft tissue injuries, and is able to help you loosen stiff muscles after the accident. The first step in healing after an auto accident is seeking the right chiropractor to help you relieve and manage any pain, even if it appears days after your car accident. Chiropractic visits are covered by all auto insurance policies. So, if you’ve been in an accident, take full advantage of your coverage and find out how a chiropractor can help you heal faster and more completely. He or she is best able to diagnose your injuries and provide the optimal corrective treatment to help you heal. What are the Long-Term Effects of Auto Accident Injuries? Delays in the onset of pain are very common. That’s why it’s so important to make an appointment with a chiropractor after an auto accident. In fact, chiropractic therapy is a proven way to prevent chronic conditions from car accidents. Joint injuries, in particular, may cause a condition called post-traumatic osteoarthritis – an acceleration of the arthritis process. This develops at an earlier age than in people whose arthritis develops from other causes. But, a chiropractor who specializes in these types of injuries can determine how much damage your body has sustained and will recommend the right treatment for a full recovery. 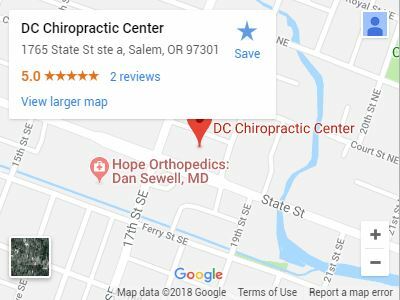 To help decrease pain and prevent long-term degenerative changes associated with an auto accident, sports injury, or work injury, we encourage you to set up an initial consultation with us by using our appointment form or calling DC Chiropractic Center in Downtown Salem, Oregon.